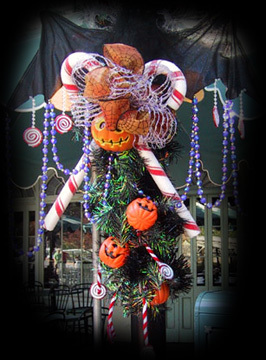 Better Haunts & Graveyards ~ Haunted Mansion Holiday Script & More! 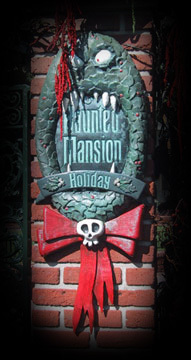 Welcome to Better Haunts & Graveyards' Haunted Mansion Holiday Page! 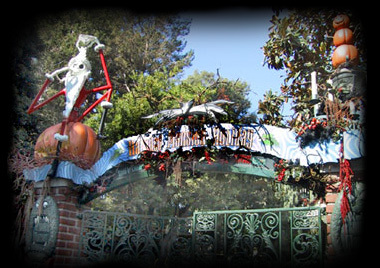 We've included a couple of rare music tracks relating to the Disneyland attraction overlay, and a transcript of the Haunted Mansion Holiday overlay from 2001. There may be errors in the transcription. Special thanks to MiladyofDisney, Kronos, the Ghost Relations Department (Leota's Spell, the Graveyard Song, and Jack and Sally's dialog! ), and Gerry for their fine transcription work! Note that the 2002 versions is different - hopefully, though, it won't stay that way! Photos by Kali Pappas and Disney. 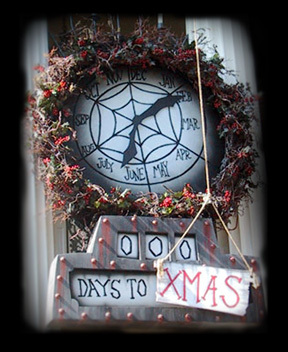 Welcome, my friends, to our Christmas Delight. Please, come all the way in. But during this season, it's sometimes alarming. When opened that morning would cause such a scare! As they say, "Look alive." This is one holiday you will want to survive. You'll notice his handiwork scattered around. This year he's decided to play "Sandy Claws,"
But when Halloween creates Christmas you might see some flaws. Sit back, rest in peace in you black Christmas sleigh. We're hope you're prepared for what Jack has in store. And remember, no flash photography please. Clutching his magical "Sandy Claws" sack. Created a Christmas you have in bad dreams. All was soon covered, adorned and deranged. It's Jack's little friend Zero - the Ghost Dog Reindeer! 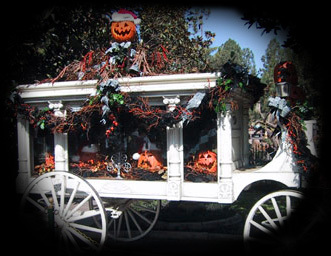 A coffin, Jack says, makes a fine Christmas present. As long as you don't get caught in its teeth. So ring our the bells, there's more cheer to uncover! 13 Rings of Power, Embracing Strenght that never ends. 12 Signs of the Zodiac, that Rule the Future and Trancend. 11 Candles Floating, their Scent of Mystery in the Air. 10 Telling Tea Leaves, that Swirled with Secrets yet to Share. 9 Magic Crystals, that Sparkled with a force that is Pure. 8 Balls of Knowledge, that answer with a truth that is Sure. 7 Pearls of Wisdom, to keep my Love Bewitched to me. 6 Mystic Mirrors, Reflecting futures yet to be. 5 Lucky Charms, to Understand the Right from Wrong. 4 Wheels of Fortune, To Spin their Rich and Golden Song. 3 Life Lines, Extending help to those in need. 2 Passion Potions, That Love and Romance may Succeed. A Star! a Brilliant Star for MY Fortune Card Tree!!! Why, even a gingerbread house could be scary. Like a nightmarish painting by Currier & Ives. They were strange and bizarre - and on the attack! 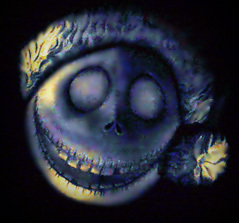 But one final touch made his bony face grin. Than a graveyard that's covered in ghostly white snow!" I like this Christmas Thing! Look Zero! I think they like our Christmas! Ho Ho Ho I really outdid myself this time! Ho Ho Ho he he he! Its Christmas Time!!! Welcome to my Christmas Delight! I have a special present just for you! What's this? What's this? What's this? What's this? For our tree of light! And a Haunted New Year! 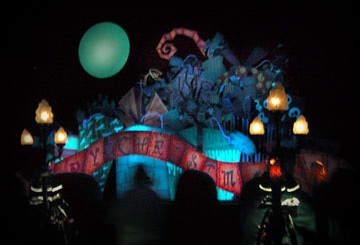 They said, "Sandy Claws, may we please have a ride?" He had much to deliver before Christmas Day! And stay in your hearts - where'er you may roam. You might get a trick, or a holiday treat! Please hurry back, we can't wait til next year. The world won't forget my Christmas Night! I'll be waiting to open my Christmas presents. You are foolish mortal # to visit us in Hallowe'enTown since 10/11/2002!